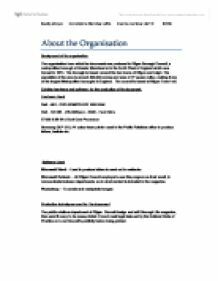 The organisation from which the documents are produced is Wigan Borough Council, a metropolitan borough of Greater Manchester in the North West of England which was formed in 1974. The borough is based around the two towns of Wigan and Leigh. The population of the area is around 300,000 across and area of 77 square miles, making it one of the largest Metropolitan boroughs in England. The council is based at Wigan Town Hall. Samsung CLP-310, A4 colour laser printer used in the Public Relations office to produce letters, leaflets etc. 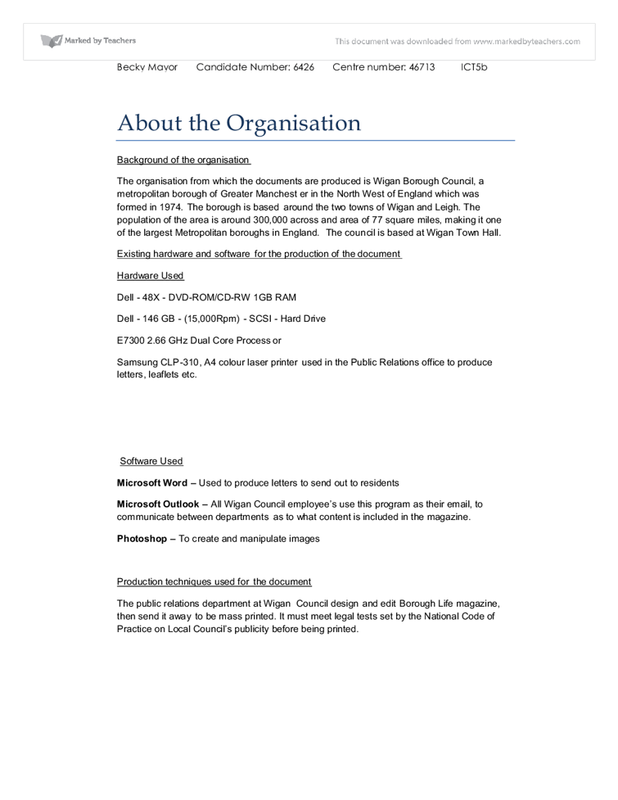 Microsoft Outlook – All Wigan Council employee’s use this program as their email, to communicate between departments as to what content is included in the magazine. The public relations department at Wigan Council design and edit Borough Life magazine, then send it away to be mass printed. It must meet legal tests set by the National Code of Practice on Local Council’s publicity before being printed. The general purpose of the magazine is to communicate Wigan Council’s priorities, plans and policies, events and initiatives to the people of the borough. It aims to reflect the councils work and show how the tax payer’s money is spent in a positive way. The magazine states that magazines values are the same as Wigan Council’s – To set high standards, being open and honest and focusing on performance. The audience of the magazine is very wide- the residents of the Borough who receive the magazine through the post four times per year. The purpose of this document is to inform readers of the risks involved when drinking too much alcohol and relate this to Wigan with figures about the Borough’s drinking habits and consequences of drinking quoted throughout. The document also gives important information regarding Wigan Council’s Young People’s Drug and Alcohol Team (YPDAT.) This suggests that the article is aimed at younger residents, aged below 19. Many points of contact are given in the document that the audience could use should they require help. Two images are used. The main is a photograph of two happy-looking young women with bottles of “alcopops” in their hands during a night out - the background is a dark scene with the reflection of neon lights as would be seen in a club. The second is a smaller image placed in the bottom left hand corner of the page. The purpose of the document is to provide advice for young people or their parents to combat the issue of teenage pregnancy. Statistics are included about the teenage pregnancy rates in the Borough along with campaign information to reduce these rates. A bulleted list of local initiatives to help young people is used. A separate text box to the main body of text titled “Advice is available” describes the Wigan Teenage Pregnancy Partnership, which contains website addresses regarding sexual health. A single, main image of a young women holding a pregnancy test in a bathroom is used. The women looks worried, staring at the test. The purpose of this document is to show residents of a new concept, the “X Zones” which are providing young people aged 11-21 with activities aimed to keep them off the streets. This initiative is funded by council tax money, so shows the reader how this money is being used in a positive manner. A youth service worker describes what X Zones involves and the ground rules. A reference to anti-social behaviour amongst young people is used. A separate text box is used with information about national acclaim of the project and the scheme from a young person’s point of view. 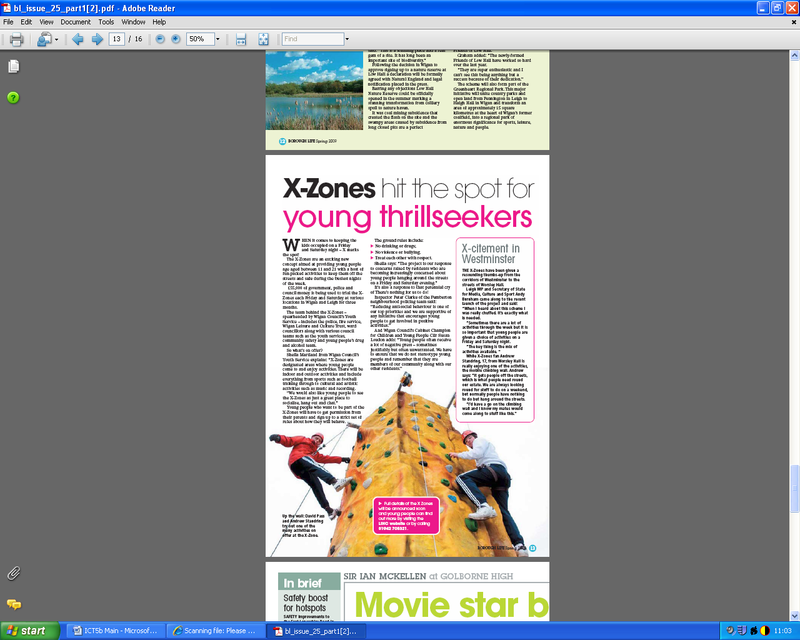 A bright and lively image is used at the bottom of the document with two people climbing a wall, which is one of the activities X Zone offers. There is a major emphasis placed upon photographs in the magazine and these are strong and colourful images which portray an active community lifestyle and attempt to make the reader feel they live in a Borough that they can play a part in and be proud of. There is also an emphasis on a healthy lifestyle through the use of image’s, many examples are given of people taking part in physical activity. The magazines policy states that wherever possible, photographs for the articles are taken by a commissioned photographer who is aware of the magazine’s house style and preferred lively images. Most photographs are supplied as digital files shot at a high resolution with a minimum of 300dpi on the cameras highest setting to ensure quality. Feature articles, which take up to two pages, often advertised on the front page. Regular items such as “Life Lines”, the beginning page with letters from residents and “Whats on” containing details of events taking place in the Borough. Borders are consistently used throughout the magazine, with a 1cm border regularly used to frame the article. However, when the page is an advertisement or contains an image at the top, a border is not used. The use of colour differs from article to article, however the use of blue is quite common, used in the header border of a significant number of pages. Green and pink are also common in articles. Two main font styles are used throughout the magazine to keep consistency. At the top of certain features is a blue border white text that summarises what the article discusses. Text boxes are another consistent feature of the magazine that often give contact details that are related to the article. The writing style used is lively and readable. All articles are written to be of public interest of the people living in the Borough. The writing used throughout also aims to reflect the council’s standards and visions. The logo is that of Wigan Council’s and is included on the front page and page 3, which is an introductory page. The logo is white with the text “Wigan Council.” The word “Wigan” is emboldened. Although the logo is simple, I think it is easy recognisable through the use of the “W”, in a different font. Wigan Council could make more use of this logo and make it more recognisable throughout the Borough by including it on more pages throughout the magazine to reinforce the sense of community. All pages in the magazine are of portrait orientation. There is a “headline” to each article and the main body of text is arranged into columns.. Each page includes a page number. The graphics used throughout the magazine are photographs which help to promote the community ethos of the magazine. The main font style used is traditional and clear, Times New Roman. This shows clarity and is easy to read, which is a requirement as such a wide range of people will access the magazine. The font size also remains consistent in the main body of the text. There are instances where the font style changes to another readable font, for example Arial. This is when the topic of the article shifts, from a health issue to a youth scheme. The new magazine will be distributed to all homes in Wigan Borough via door to door delivery. It will be the Spring edition of the magazine. It will take approximately 20 days from publishing to distribute the magazine to the Borough. The magazine will also be made available at the reception and waiting area of the Town Hall for visitors to take copies of. The public relations department at Wigan Council are responsible for the content included in the magazine, so staff costs will occur. The magazine will need to include colour to appear attractive and fit in with the house style, this will cost more than just black and white copies. The cost of paper will also be a factor as the magazine is being produced on a mass scale of 20,000 copies. The software required for the new magazine is Microsoft Word to produce the magazine, this will allow for different text styles, images, headers, footers and borders to be included in the document. 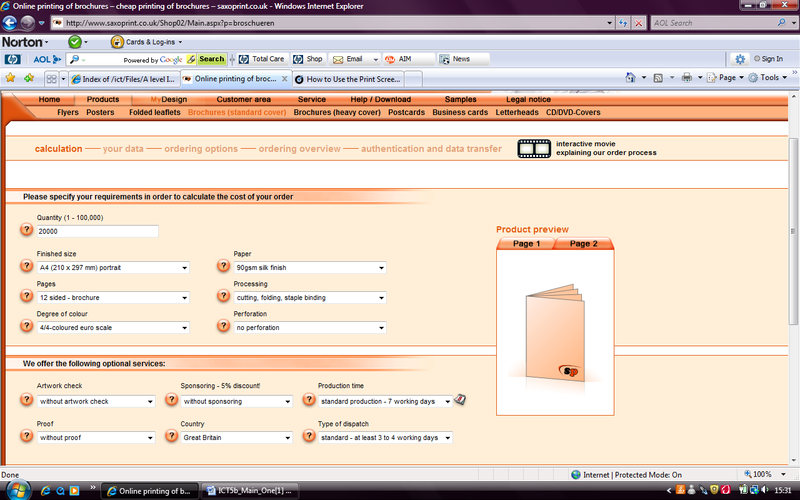 This is commonly used and well known software that staff will feel familiar and confident with. Integral USB flash drive - 4 GB for backup purposes each time the magazine is worked on. Time constraints will be a major factor in the production of this new magazine. Research began on 31st January and the deadline for the final copy is 27th April.15 hours are allocated in order to produce the final magazine along with user documentation. This is a limitation for me as there is not sufficient time to research in much detail as I wish for the magazine and more time may be needed to ensure the magazine content is of the highest quality possible. As this magazine is being distributed on a large-scale basis, the magazine needs to be light-weighted so that many copies can be distributed at one time. The magazine must be printed on A4 paper, with all pages of portrait orientation and main articles within being double page spreads. Page numbers must be included to aid people reading the magazine and a contents page included to correspond with the page numbers. There will be ten pages in the magazine, this includes the front cover and contents pages. All pages of the magazine will be printed on standard, white 90gsm paper to keep costs lower.. The use of colour will be essential in sustaining reader interest along with images of interest therefore the council are prepared to pay extra to have a coloured magazine. The front page will allow the reader to immediately identity what the publication is to prevent it being mistaken as junk mail. Will achieve this by making the title “Borough Life” large and clear text – WordArt. The Wigan Council logo will be included to show the magazine as an official document. There will be an indication of articles included within the magazine. There will be two images on the front page – a main background image and a smaller image that will include people swimming – linked with an article in the magazine. The issue number (25) and seasonal edition (Spring) will be included in the header. Will match the automatic page numbering on all pages of the magazine. Two text boxes used with Times New Roman font, including details of a drinking survey conducted in the area and the effects of binge drinking. Colourful image of a “shot” drink included at the bottom of the page. This will inform the reader of statistics – teenage pregnancy rates in the Borough, along with details of a service already at use in the town centre for young people. An image will be used of a pregnant woman holding her stomach. Black, WordArt title, continuation from page 5. Text box of schemes to help the young people, bullet point list. One main text box, Times New Roman font, with an overview of the project and what a council worker who has been involved in it says it brings to the community. Three separate text boxes, all with Times New Ronan text. One deals with parental permission, one with a red line that states the rules of the project and one with a minister’s quote and when the project runs. One text box with overview of the scheme and Council leader’s comments regarding it. Times New Roman font. Two text boxes included – Both with Times New Ronan font. The telephone numbers of all the Borough’s pools is in bold. The other, with a white line, will give details on how to order a Lifestyle Card. All Pages – The page number is too large therefore not visible in the footer of the magazine, make slightly smaller to correct this. Add a few images to represent what is included on certain pages. The top of this page, with the slogan and logo, is successful in fitting in with the magazines house style and will immediately inform the reader. The “Useful Sites” text box is too big. Make it slightly smaller and the title more obvious, perhaps by emboldening it. The lively, colourful image of the two girls is a good choice for this piece. After “important decisions” make a new paragraph for the rest of the text in the column. The “Advice” box works well and is easy to identify. An issue with the text which includes information about the schemes that implemented to combat the problem – there is a lot of information that needs to be included in this box and the actual names of the individual schemes are not apparent. If the reader wants to find out more regarding the scheme. Change each name so the font size is larger than the rest of the text –size 12 and embolden. The change of font colour, to red for “X Zones” in the title is effective-it stands out to the audience and reflects the active idea of this project. Each time “X-Zones” is mentioned in the article, change the font colour to red and embolden. In the “Rules” text box, the bullet points look a little inappropriate and the clear centre circle may even make the rules seem less important than a black, bold one! Change the bullets to a more appropriate style. A good choice of image that reflects the project well. Once again, embolden each “X-Zones” and make red to keep consistent with page 7. Reduce the spacing by one line between the two paragraphs as there is too much white space here. The image and logo look professional and convey the ethos of the magazine effectively. Enlarge the screenshot of the WLCT website a little as it may not be clear what the website is to some readers. files I will be using. The magazine itself will take up around 2.30MB which means there is plenty of memory on the system to deal with the magazine. scan in certain images from the original magazine to include in my version. USB Stick to backup the magazine after working on and editing it. A possible problem with this is that there will not be sufficient memory and another USB stick device will have to be purchased. Also has the option to print double sided if I decide to do so. Prints 20ppm. A problem with using this printer is that it is networked and if many documents are sent to print at the same time, a backlog can occur and result in a long wait to retrieve copies. Monitor – 15” HP LCD Monitor – This is a high resolution monitor that will allow me to deal with a wide range of images and colours to include in my magazine. I have chosen this package to create the actual magazine. The advantages to this are it will allow me to pick from many different font styles and colours, use WordArt, borders and shading which will allow me to keep the existing ethos of the magazine. A key feature will also be columnar text boxes to include the main text of the magazine. JPEG – This is commonly used to compress images. It is the format used by digital cameras, which will be used in my magazine. GIF – This format supports images with a 256-coloured palette. It is most suited for images which have solid areas of colour in my magazine. Logos are particularly well suited so I shall use the format for my Wigan Council logo. Different techniques are available to me when making the decision on how to bind my magazine. A possibility is to staple the magazine and although this does not look the most professional, is the cheapest option. Heat binding is a more expensive option available, however looks professional and gives a neat impression of the magazine. Ring binding the magazine is another option, however I feel this is not a practical option when delivering mass copies of the magazine. Plastic combs cost around £12.00 for a pack 100 which is another more expensive option as many would need to be purchased. Consequently, I have decided that the stapling technique will be the most suitable and cost-effective option considering the sheer amount of magazines that are to be printed. Each ink cartridge costs around £22.00 and prints around 10,000 sides. Epson-compatible will have to be used. The cost if the magazine was photocopied. 80g standard paper can be used to photocopy and works out cheaper than a higher quality of paper. – The cost of photocopying at college is 5p per sheet. The cost if I used a laser printer to print the magazine for a better quality document. 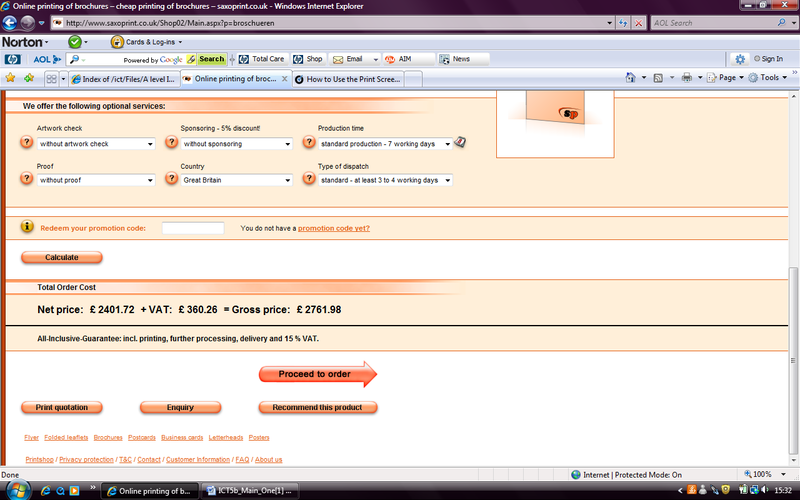 Here are the costs of having the magazine printed by the professional company, Saxo Print. This would be 20,000 copies on 90gsm paper and staple binding included within the price. You can also see the total price including and excluding the shipping costs, so customers can see how much they will have to pay for the packaging and posting. There is also a field for a promotional code, which can be entered if the customer has a voucher for this website, which would give him discount on the purchase. Price - Out of all the product information provided this is the most vital, without this the customer would not know whether the product is worth buying or not, if the company did not include the price of the product then customers would be put off straight away buying from them online. And also as the system will be computerised it will offer a greater deal of accuracy also. And lastly with the solutions offered for administration, the client will need my solution as it offers to improve their business by computerising it via a database. The problem with this order sheet is that it does not have a print screen button. This button allows me to print of the sheet and show what I have brought. Another macro button needed is update stock; this button allows me to update the stock I have brought to the main stock data base. +Schedule – can it be built in time? âA report is produced at the end of this stage and the management decide whether to approve it or not. Analysis âAnalysis involves finding out about the current system and investigating the requirements of the users. âFour main ways to investigate; +Interviews +Questionnaires +Observation +Examining existing documentation âWho uses them?